and how Americans pronounce <t> with "the glottal stop." In your native language, there is probably only one pronunciation of <t> . It is simply /t/. However, as we've mentioned before,this is not the case in American English. There are actually three main pronunciations of <t> . Notice that when I said "might " and "late" I didn't pronounce the <t> as we might expect. I didn't say: I might be late using the aspirated <t> /t/ we discussed in podcast 52. Instead, I used what's known as the glottal stop. The glottal stop involves stopping the air flow in out throat using the vocal cords. we bring our vocal cords together and close the space known as the glottis. It almost sounds like the <t> is completely silent, completely dropped. /ʔ/ = IPA symbol for "the glottal stop ". "The glottal stop ", /ʔ / is very common in American and Canadian and English. Americans use it all the time especially in informal conversation. Learning how and when to use this sound will not only improve your pronunciation but also greatly improve your listening skills. To become aware of the glottal stop /ʔ /. To learn how and when to pronounce <t> using a glottal stop/ʔ/. When do Americans use the glottal stop? If <t> comes before a consonant or before a pause, we may use the glottal stop /ʔ /. For example in the previous example, I might be late. The first <t> in "might" comes right before the <b> in the word "be". Because this t comes right before a consonant it may be pronounced with a glottal stop. Let's look at the next <t> in the word "late"
This <t> comes at the end of the sentence; it comes at a pause. And therefore this <t> may allso be pronunced with a glottal stop. Is it always necessary to use the glottal stop in these cases? One question I get from my private students here in New York, is whether or not it's absolutely necessary to use glottal stops before pauses. The answer is no. But be aware that Americans use it very often. In fact, maybe you just noticed that I used it when I said the word "but". I didn't say /bət/; I said /bəʔ /. In addition, Americans use glottals stops before consonants most of the time because it's simply easier for us; it involves less movement of the tongue. The first step is to become familiar with the rules for when to use the glottal stop. Once you become aware of the rules, you can begin to practice it and you will begin to use it and hear it instinctively, without thinking, just like a native speaker does. 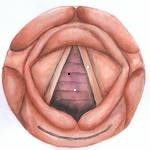 The glottis is the space between the vocal folds in the larynx. The vocal folds are located right below your adam's apple, the bump on your throat. Glottis: As you vocalize, quickly squeeze the vocal folds together, closing the space, the glottis and stopping the air flow and sound. It's a fast and strong movement. Tongue: Bring your tongue tip to the ridge as you would in aspirated <t> but don't release the air-press your tongue tip and freeze. Hold your tongue tip in place without releasing the air. Hold your tongue tip against the ridge. Glottal stop /ʔ/ is a stop consonant because we stop the air by pushing our vocal cords together. voiceless consonant because we do not use our voice to make this sound. Our vocal folds come together very quickly but do not vibrate. Building the ability to make the glottal stop requires some practice. Let's do an exercise which will strengthen the muscles needed to make this sound. Another important aspect of using the glottal stop correctly is shortening the preceding vowel. date /deɪʔ/ vowel /eI/ is shorter. day /deɪ/ vowel /eI/ is longer. Exercise: Listen and repeat paying careful attention to vowel length. Exercise: Listen and repeat the following words containing /ʔ/. Exercise : Listen and repeat the following American expressions and idioms containing /ʔ/.